But wait, let’s see if flying is really the best way to travel in Thailand this case. You are most likely to spend about one to two hours getting to Don Mueang airport from let’s say, Khao San Road or Silom. You need to arrive at least one hour before your flight; the flying time to Chiang Mai will be about 90 minutes; then throw in the waiting time at the airport to retrieve your luggage and the time to get from the airport to your guesthouse. Ok, in Chiang Mai the airport is conveniently located centrally but it is not always the case. Anyway, it brings your travel time to about 5 hours, but most probably these are daytime hours. Why lose them if you can board an overnight bus from Bangkok to Chiang Mai, sleep all night through and arrive to your destination early in the morning? Yeah, we know that not all of you guys are able to sleep on the bus, yet there are definite huge pros in choosing a bus for almost every traveler. Not yet convinced? So here are some more reasons to make you reconsider your attitude towards bus travel in Thailand and tips on how to travel Thailand by bus. Why travel around Thailand by bus? This is of crucial importance if you are pressed for time – have a limited number of days for vacation or just wanna make a quick weekend getaway. Wherever you fly within Thailand be ready to spend half a day. If you opt for a night bus in Thailand, you have the whole day all for yourself. There is an extremely wide choice of bus routes in Thailand departing from Bangkok. Wherever you go North, Isan or South, you are most likely to find a direct bus even to some of the most ‘out-of-the-beaten-track’ destinations. We are serious: there is no a single province in Thailand where you cannot get by a direct bus ride from Bangkok. If you are traveling from other cities and towns, the route map can be limited, but it will for sure feature the major provincial centers in the neighboring provinces. It is undeniable and logical that the network of bus routes in Thailand is much wider than the routes covered by flights. Only the major cities and towns have airports while even every in-the-middle-of-nowhere village has a bus station or at least a bus stand. Well, if you choose to travel in Thailand only by a VIP24 bus, then a bus ticket can cost you as much as an air ticket. But even express class buses in Thailand are relatively comfortable, and a bus from Bangkok to Chiang Mai, or a bus from Bangkok to Phuket, by an express service can cost you THB 400-450 [about USD12], luggage and a meal included. If you are a budget-conscious traveler, travel in Thailand on a night bus will allow you to save a couple of bucks which otherwise would have been spent on accommodation. Read: How much does it cost to travel in Thailand? Planning to travel in Thailand by bus or overnight bus? Do you want a hassle-free experience? 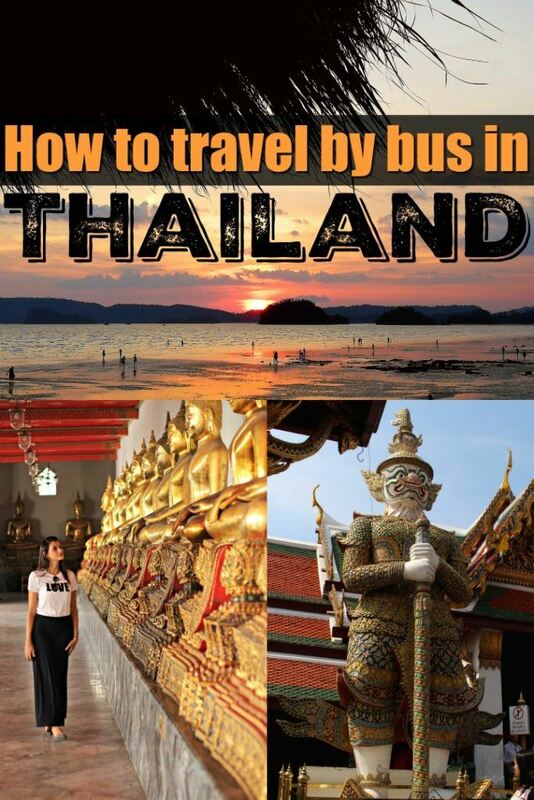 So check out our quick guide on how to travel around Thailand by bus and have fun! Any big town in Thailand has at least one bus station serving buses of different bus operators heading to and arriving from various destinations throughout the country. 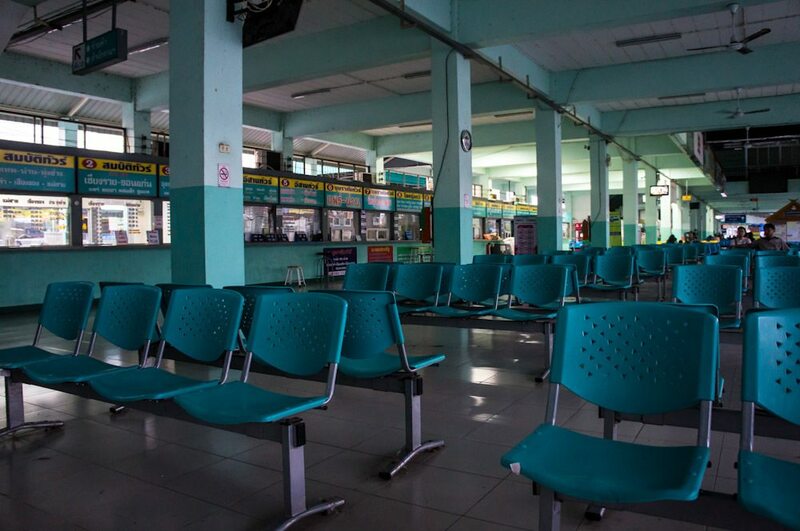 This is how a typical bus station in Thailand looks like. This is a bus station in Mukhadan, a northeastern border town. 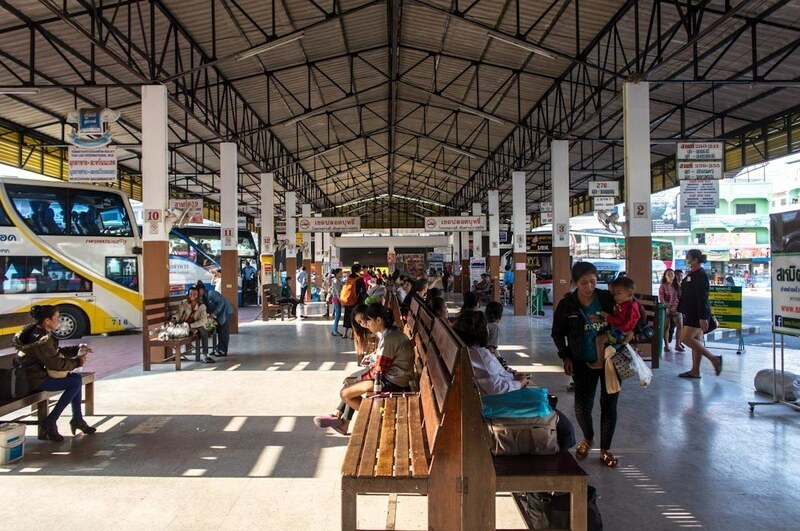 This bus station serves all buses arriving at Mukdahan from around the country as well as international bus trips over the Mekong to Savannakhet in Laos. One more picture of a bus station – Trat this time. It is helpful if you travel further on to Koh Chang or to Hat Lek to cross the border over to Cambodia, there are daily bus from Bangkok to Cambodia. In most cases, there are two bus stations in provincial centers or big towns. The bigger and normally the newer one is called Bo-Ko-So, or Terminal 2. Usually, it is located quite out of the center, between 3 and 10 km, and sits on a highway or major national route to make it convenient for any passing by bus to detour. It is a long-haul bus station. An example of a big Bo-Ko-So is the Arcade bus station in Chiang Mai from where you can get a bus to almost anywhere, from Nong Khai in the northeast to Krabi in the south. This is a Bo-Ko-So in Phitsanulok with ticket booths of different bus companies selling tickets to a variety of destinations. A smaller and usually the older bus station is often called ‘Terminal 1’, or ‘In-city bus station’ and situated in the center of the town or city. 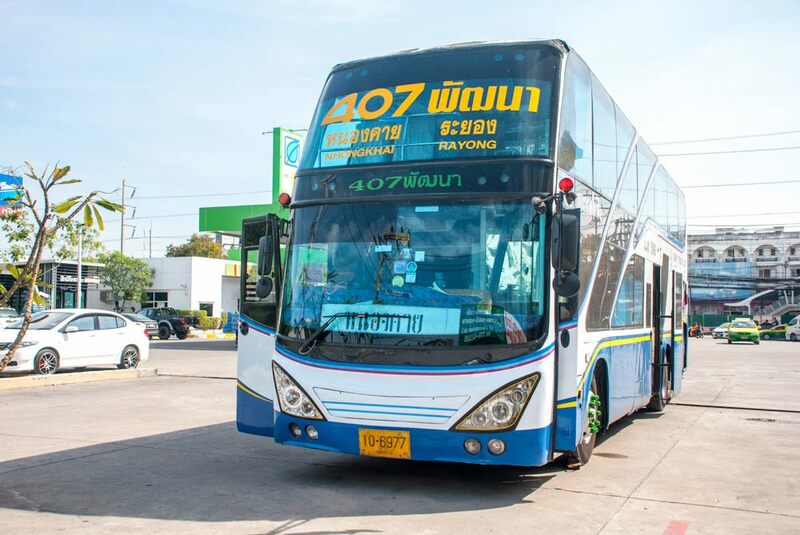 It may still serve interprovincial routes and almost always can offer direct buses to Bangkok, but its main fleet travels to destinations within the province or in some neighboring provinces. 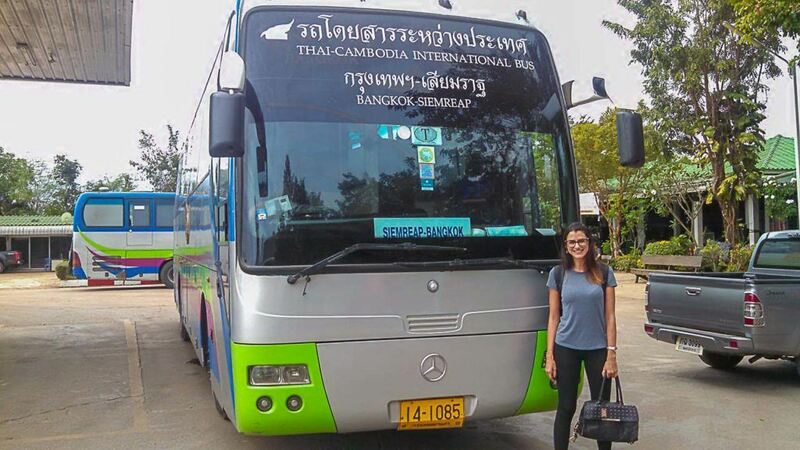 If you travel by a long haul bus in Thailand you will probably be dropped off at a Bo-Ko-So from where you will need to organize an onward transport to the city center. Note that some long-haul buses do however stop to the ‘old’, or in-city bus station, so check this out before buying the ticket. 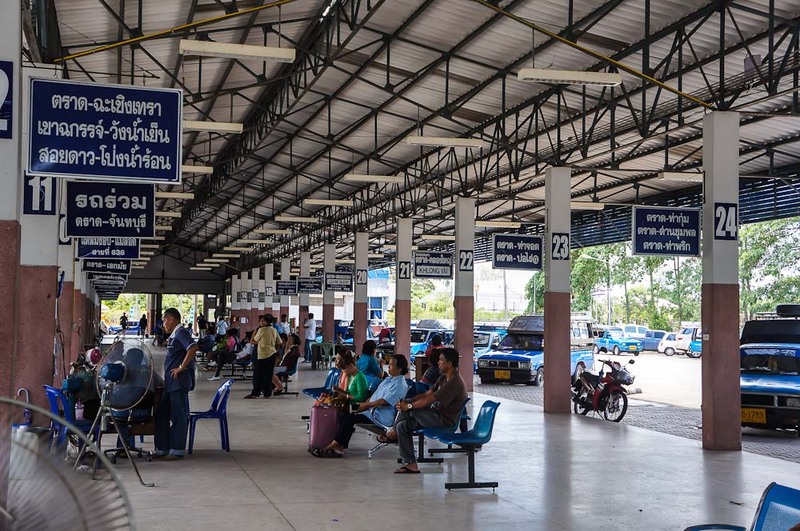 If not, in many cases there is a reliable songthaew link between the two bus terminals with a one-way ride priced between THB 10 and THB 40 depending on the local price policy. E.g. in Phitsanulok you will pay THB 40 while in Ubon Ratchathani (4) which boasts an incredibly convenient public songthaew system, it is a mere THB10. Another option is to download the GrabTaxi App and ask for a taxi from the station to your accommodation. GrabTaxi works like Uber but you pay the ride directly to the driver. It’s super easy to use, fast and safe. Uber is not allowed in Thailand, but you can find GrabTaxis in almost every town. – Timetables with a list of routes served and companies operating these routes. Here are ticket booths with destinations, prices and companies operating the routes at the Mukdahan bus station. – Platform number – if it is not indicated, you have to head to the platform which serves buses heading to your destination. – Some tickets may contain a special meal coupon, do not throw it away. In certain cases the meal coupon will be given to you by the coach attendant in exchange for your ticket. Use it to pay for your meal at a long stop that it will be announced during the journey. Oh well, we are in Thailand and food is crucial here. So no long bus journey can exist without a meal, either served on board or in a cafe en route. It is forbidden to drink beer or any other alcoholic drinks inside buses in Thailand and in theory, it is equally prohibited to eat too smelly food. The latter requirement though is never taken seriously. After each pit stop at a gas station, the bus will be filled with a pungent aroma of Lays chips, Khao Pat or similar delicacies bought by hungry passengers in a 7/Eleven. As a rule, long-haul buses in Thailand make at least two or even three bathroom and meals stops, one of which lasts about 20 minutes to allow passengers to have a coupon paid meal at a food court. Often such stop happens in the middle of the night, but who cares? Some bus companies instead of making a long meal stop serve lunch boxes on board. 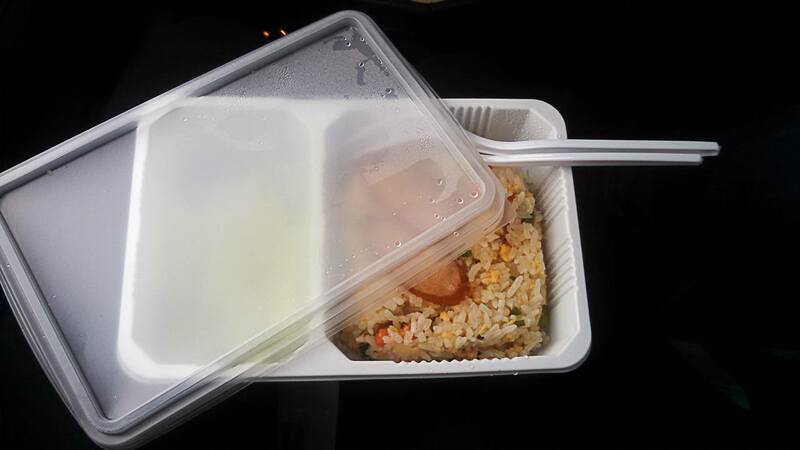 These lunch boxes will contain some rice and curry complimented by a soft drink, often sweet milk or juice. Either way, you hardly have chances to remain hungry traveling by bus in Thailand! Fried rice served on board. Good news: in the overwhelming majority of cases buses in Thailand depart exactly as stated in the timetable and arrive to their final destination in time or even ahead of schedule. The only exception is holiday time: do not expect your bus to stick to the usual schedule if you travel during New Year or Songkran. Multiple-hour delays are common during these periods thanks to countrywide exodus from big cities to holiday destinations and home sweet home’s. One of the most frequently asked questions is where to find the timetable for buses in Thailand. The most obvious way is to check at the bus station – though it is definitely not the most convenient one! If you know the name of the bus company you want to travel with – which is unlikely, but if – then you can check their website if they have one. The problem here is that many bus companies either do not have a website, or have only in Thai language, or do not support online booking. One of the easiest ways is to check the timetables and the prices of buses in Thailand on 12go.asia website. They sell tickets of different bus operators in Thailand so you will be able to compare prices, reviews, and choose the most suitable journey. On the 12go.asia website you can also buy tickets to travel in Cambodia, Vietnam, Myanmar, Malaysia, India, China and Sri Land. How much does it cost to travel by bus in Thailand? The price of a bus ticket in Thailand depends on the length of the route and the class of the coach. The Thai government sets prices for a 1 km ride depending on the price of fuel. Commercial companies charge extra for higher bus classes, VIP or VIP24. Buses in Thailand can be divided into several groups: public buses plying routes within cities and towns [we won’t be talking about them here]; local buses serving individual destinations within one province or neighboring provinces; and interprovincial, or long-haul buses. Different companies use different names for buses of more or less the same category. E.g. a big Thai bus operator, Nakhon Chai Air uses ‘metal’ names: Platinum, Gold, Silver, Bronze. The majority of operators offer Express, VIP and VIP24 buses or 3rd, 2nd and 1st class buses. Note that there are no sleeper buses in Thailand. – During night rides fleece blankets are distributed. How to tell a VIP24 from an Express class bus in Thailand? In Thailand, VIP24 bus [1st class, platinum class, etc], as the name suggests, has only 24 seats organized 3 per row instead of the usual four. Seats are wider than standard bus seats and there is more legroom. Sometimes each seat is equipped with an individual entertainment system. A VIP bus in Thailand [1 or 2 class, gold or silver, etc] is a 32-seat coach, still very comfortable and often featuring built-in massage seats. Express bus [economy, bronze, etc.] class buses contain from 40 to 56 seats. Western travelers sometimes complain that the seats are too narrow and there is not enough legroom. Well, you get what you pay for, and these buses are still quite a decent option. The most important thing to note here is that they normally call to all the bus stations and pick up passengers en route thus traveling at a much slower pace than VIPs. Though there are a lot of daily bus trips to many destinations from Bangkok and other cities and towns in Thailand, we do recommend booking bus tickets in advance. Normally, a couple of days before your planned date of departure, if you are not going to travel during peak holiday periods [Christmas, New Year, Chinese New Year, Songkran…]. If you are planning a bus trip from/to Bangkok in high season or if you want a seat on a VIP24 bus, then booking in advance is a must. If you are looking for some rough bus experience in Thailand, try one of the local buses. They can come literally in any form, there are buses with soft and hard seats, buses with AC or with ceiling fans, worn-out cramped buses or cute and relatively new ones. These buses connect destinations within a 4-5-hour bus ride. They take on board everyone who wants to go, it means that often there are more passengers than seats. There are passengers transporting hens and roosters, carrying oversized luggage, but this is part of the fun! A good thing, in Thailand you can’t smoke inside the bus. Such buses are often the only means of public transport to get to certain far-flung destinations. E.g. Sangkhlaburi in Kanchanaburi province is a good example. They travel slow but sometimes follow extremely scenic routes, and they are cheap. No need to buy tickets in advance, just show up at the bus station and explore Thailand by bus. Where and how to buy bus tickets in Thailand? To save time and energy we buy our bus tickets in Thailand on 12go.asia website. They offer a great number of Thai bus operators and also offer train, plane and ferry tickets wish you consider other ways of transportation in Thailand. On the website you can also buy the famous joint-ticket, one ticket that combines different means of transportation, for example, Bangkok to Phi Phi Island will be a joint-ticket including bus + van + ferry. Through Thai language aggregator websites. There is a number of such websites like thairoute and some of them are slowly adding English to their interface. You can pay your bus ticket online or through 7/Eleven. If you need a minibus ticket plying the route from/to a tourist location then many guesthouses either operate their own transport or resell such tickets. As a rule, the price will be the same if you buy directly from the minibus company. And to round our guide about how to travel in Thailand by bus, here is a list of most popular van/minibus and bus routes in Thailand with prices. I’m sure now you have all the information you need to travel in Thailand. Book your bus tickets through Thailand and enjoy the ride! Love this post? Pin it or later? I enjoyed reading your article about buses in Thailand. It was very informative. I didn’t know that there were different kinds of buses available. I didn’t know that they served meals too and that there were VIP buses with entertainment units. How Much Does it Cost to Travel to Arenal, Costa Rica?